Track record: Bovespa Index (Brazil) – 2017-01-08. The Brazilian stock market was one of the best performers of 2016, especially counting from its low in January of 2016, to its high in November of 2016. EWT Investing did not analyze the Bovespa Index (BVSP) on a regular basis until May 2016, but regardless, we’ve made some calls that might be useful to take a look at and see if anything can be extracted from them. First was a brief analysis update for March of 2016. In it, a target of at least 54000 was set for the ongoing wave formation, a goal which wasn’t too brave, but was still +6.3% out from the current Bovespa close at that time. The 54000 target was achieved approximately a month later. At the beginning of October, Bovespa Index indicated it was still in a 3rd wave upwards, but was approaching the last component of said 3rd wave. It is important to know when impulses extend, because market trends often go farther than anticipated – at the same time, it’s also important to know when it’s not appropriate to enter new positions, but rather keep existing positions running with a more careful stop. As expected, the final phase of the 3rd wave became quite small, and while it did have approximately +9% in it from our warning, if you held a longer-term positive position until today, starting at our from 6th of October call, you’d be up approximately +2%, and having suffered through a correction and roller-coaster-type of market, which has a tendency to shake people out at the worst spots. A potential +9% profit could also have been almost non-existant, because the BVSP did fulfil minimum price criteria just a few days and approximately +0.5% after the early October call. If a correction had started from there, chances are the position would’ve still been under water today. Shortly after the top in November of 2016, the strength of the downmove suggested a new market phase had begun. We issued a call for the 48000-52000-range to be reached in an expected 4th wave correction. During the 19th of December 2016, we issued an update suggesting strong support was close at hand, was almost oversold according to our adaptive channel system, and the BVSP actually turned around approximately 2% above that support zone, and has trended upwards since then. Hence, it is possible that that our call for the 48k-52k zone might fail in the type of formation we initially expected. It remains to be seen during H1 2017. Trends often extend farther than anticipated. Hence, the old, oft-repeated, but still true saying “Let the trend be your friend.”. At some point as trends progress, they reach stages where greater uncertainty is introduced. At that point, new positions carry a much greater risk, and should perhaps not be initiated by the risk-averse, or position sizing reined in. Existing positions need to be monitored more closely. That was the gist of the early October-update we made. Were these calls successful? Maybe, maybe not – in this case it is not clear cut and I’ll leave to the reader to determine the usefulness of the calls. Extended Elliott Wave Theory dictates that the markets can never be predicted, and that they vary in terms of predictability. Failure to recognize this leads to frustration – take our hard-fought-to-attain advice on that point. If you are late to a trend, you must know the ramifications of a late position, which are tougher risk management, greater risk for an at least temporary setback, and even a catastrophic trend reversal. Interestingly, it is the fact that humans know (either consciously or subconsciously) about the dangers of jumping into a trend, that cause it to drag on and in the end be a good idea to participate in (well, at least for the ones who catch the first 50% of it). As the trend progresses, it looks safer and safer to participate in even considering the factors outlined above, until lack of willing liquidity and/or strong external triggers, cause it to stop and consolidate/reverse. As we enter 2017, the Bovespa Index is in a low-predictability phase. 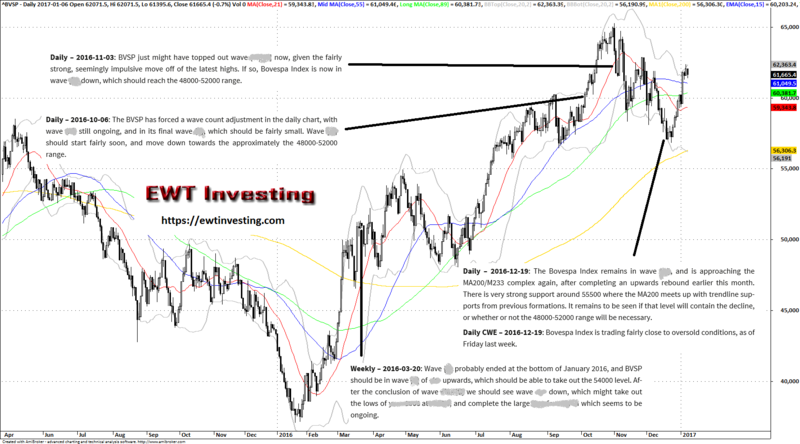 EWT Investing continues to provide 1-2 updates per week on the Brazilian Bovespa Index – on Monthly, Weekly and Daily time frames. The analysis includes assessments on trend directions, predictability, risk/reward, as well as Extended Elliott Wave Theory analysis backed up by technical indicators and our adaptive channel system.